Perfectly tart, sweet, and easy-to-make cranberry sauce! Kick your holidays up a notch this year with this delicious sauce. 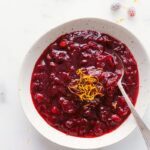 If you’re serving this easy cranberry sauce for Thanksgiving or Christmas, consider serving it alongside these mashed potatoes, a wild rice salad, roasted vegetables, Thanksgiving dressing, and/or this watergate salad. What I’m sharing today is the best cranberry sauce I’ve had! It’s just the right amount of sweet while still remaining true to the delicious tart profile of cranberries. The texture is perfect and with how easy this sauce is to make, you’ll never want to go back to the cans! And as it turns out, making homemade cranberry sauce is not as difficult as you’d think. Start by combining white and brown sugar with cranberry and orange juice. Whisk to dissolve the sugar and then stir in the fresh cranberries. Watching closely and stirring occasionally, the cranberries will begin to become soft, break down, and thicken the sauce (thanks to the natural pectin in cranberries). 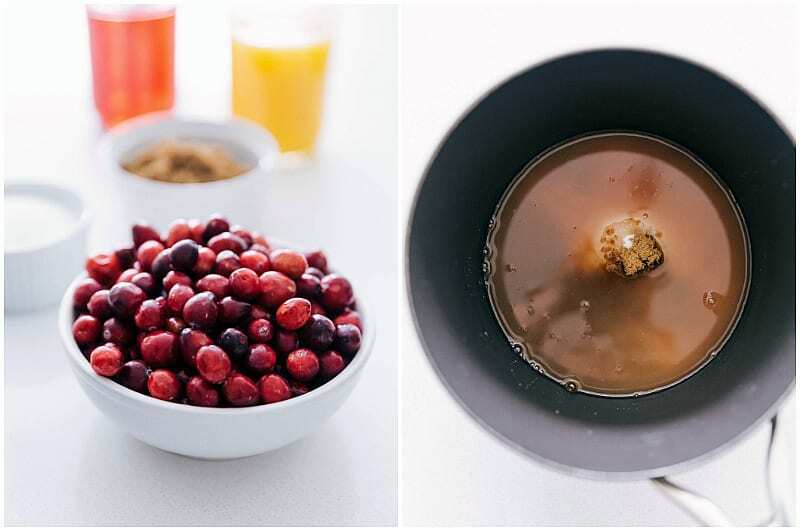 You can use a spoon to smash some of the cranberries as they become tender. Let stand off the heat and the sauce will continue to thicken! 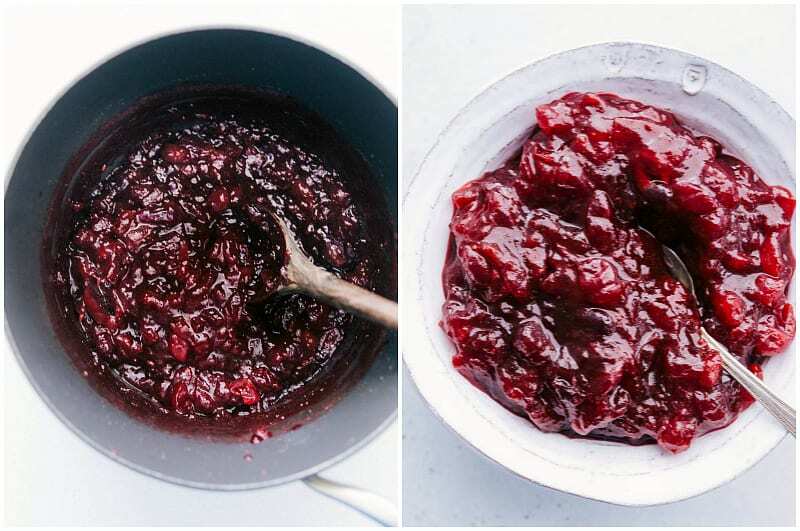 How do you make the very best cranberry sauce? The majority of recipes combine 1 cup of sugar, a bag of cranberries, and 1 cup of water. To make it the BEST though, we’ll be making some tweaks: reducing the sugar (and switching out some of the white for brown sugar) and replacing the water with cranberry juice and orange juice. The cranberry juice adds an extra layer of tart cranberry flavor while the orange juice adds an additional layer of flavor and sweetness to create a hint of cranberry orange sauce. Fresh juices make all the difference! Definitely the “secret” to this sauce! Is canned cranberry sauce good for you? Cranberries are really good for you, but they are naturally very tart. Consequently, most cranberry products you purchase will have added sugar. Canned sauce typically has quite a bit of sugar and isn’t a healthy food for that reason. Homemade cranberry sauce also has quite a bit of sugar, but you are able to control the amounts and you’ll know EXACTLY what is in it when you’ve made it at home. 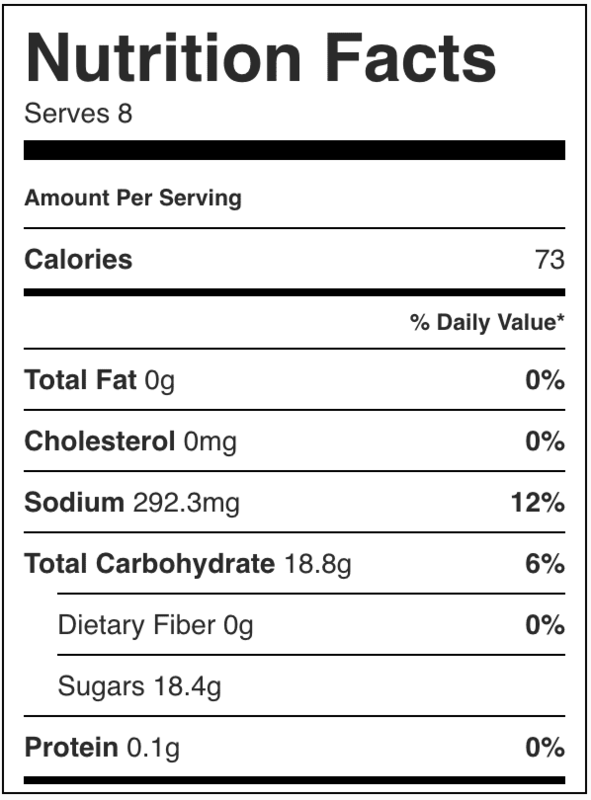 What vitamins are in cranberries? Cranberries are a great source of vitamin C and vitamin E. Both vitamins are have crucial antioxidant nutrients — these nutrients help keep your body healthy. Can you make cranberry sauce from dried cranberries? While I highly recommend making cranberry sauce from fresh cranberries, it can be done with dried cranberries! Check out this recipe for more information. If you’re wondering if you can substitute dried cranberries for fresh in this recipe, I would not recommend it. Is cranberry sauce supposed to be hot or cold? 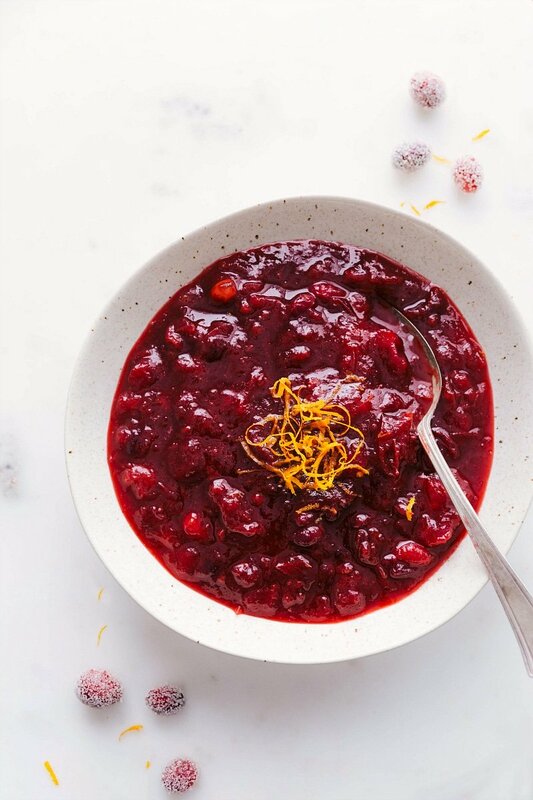 One of the best things about cranberry sauce is that it can be made ahead of time so you won’t have to stress about making it during a busy day of prep. You can prepare the sauce as early as a week in advance and store it in the refrigerator. Let the sauce cool at room temperature, then place it in a covered container in the refrigerator. Generally cranberry sauce is served chilled or at room temperature. Perfectly tart, sweet, and easy-to-make cranberry sauce! 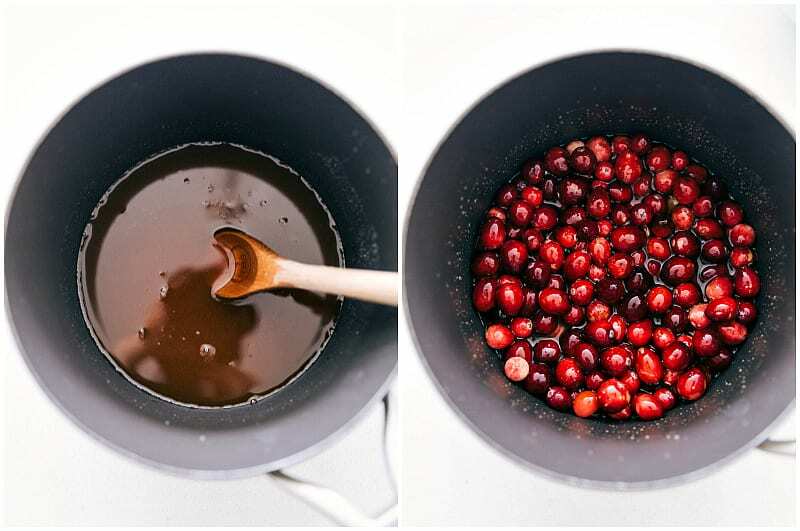 In a medium-sized saucepan over medium heat, dissolve both sugars in the orange and cranberry juice. Remove from heat and place sauce in a bowl. Cranberry sauce will thicken more as it cools. Store for up to a week in an airtight container in the fridge. I have been making my Cranberry Sauce with Orange Juice and Suger for over fifty years. It is the best!!! The red color looks so good. I will definitely try this homemade sauce. Thanks for sharing! Why only make this once a year for Thanksgiving and Christmas? Grab several bags of the fresh berries, wrap them in an additional freezer bag and add the date. 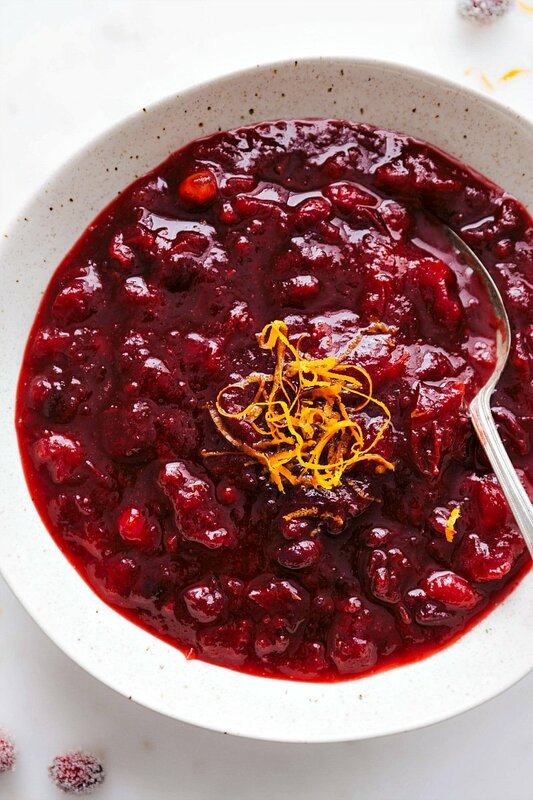 You can make this cranberry sauce all year long. Also, you can make some incredible freezer jam using cranberries or with a variety of fruit: berries, apple. My husband made the cranberry recipe and it was very good.